Die Highlight: Layered Snowflakes Die Set + Video! Hi, it’s Therese and it’s time for another Die Highlight. 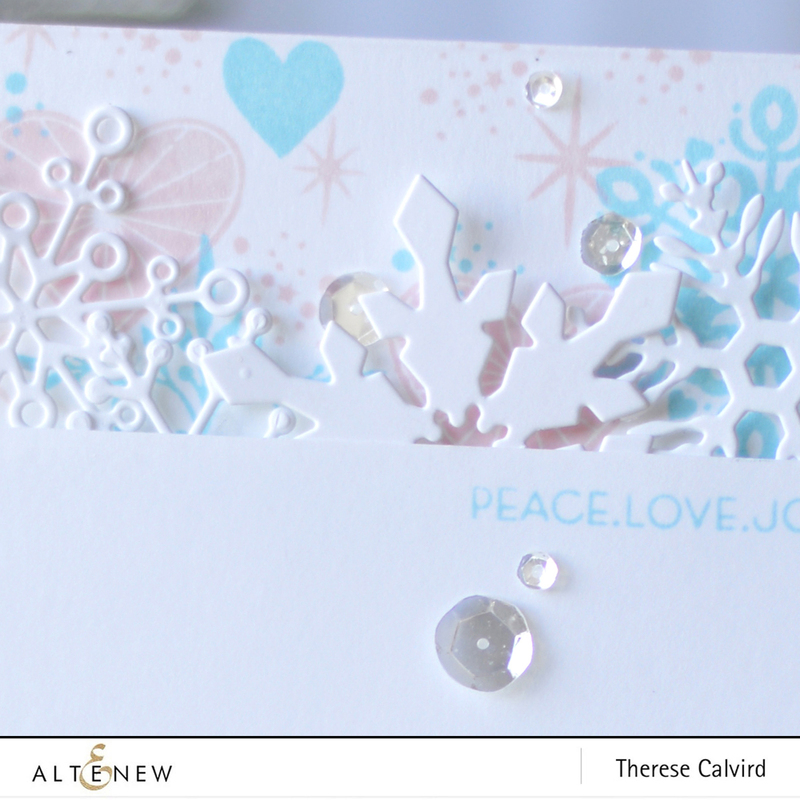 Today I used the Layered Snowflakes Die Set and I have three cards and a video to share. My first card has a border created with the Layered Snowflakes Die. I stamped my own background pattern using the Peace Love Joy, Starry Night and Blessings Stamp Sets. I used the Frosty Pink and Sea Breeze Crisp Dye Inks. My second card design has the same colors blended in the background to highlight the negative die-cut snowflakes within the panel. I stamped the sentiment in Silver Stone Crisp Dye Ink. I wonder if you can see the Iridescent Shimmer Ink splatters in the background? My final card and video are very different. This time I used the Birch Wood Specialty Paper to create a panel, you can watch the process in the video linked below. I heat embossed a white sentiment from Festive Poinsettia on Apple Red Cardstock. You can watch the video below or watch it in HD on YouTube. This Layered Snowflakes Die Set is divine, I hope you love it as much as I do! Thanks so much for visiting today. Was great fun watching you make the wooden snowflakes card over on YouTube!! Thanks so much for sharing!! Awesome cards, I love the wooden snowflakes, thanks for the video! The technique of adding the die cuts to the fun foam inside the entire sheet looks like a good idea! Wood snowflakes! What a fun concept! 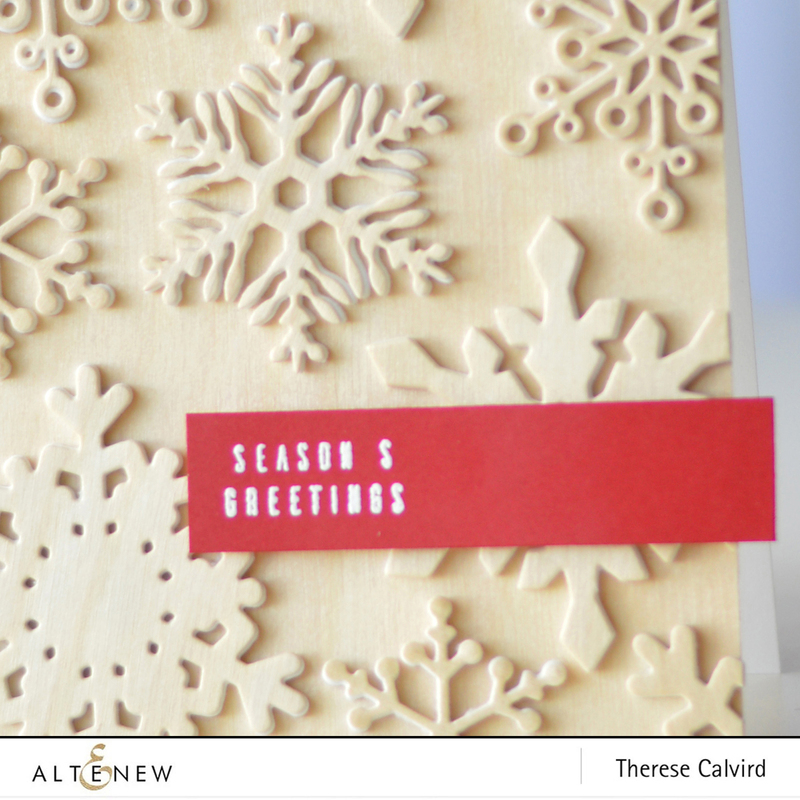 Love the design and look forward to seeing you design a card with the snowflake dies layered up as well! Yes, they look awesome all layered up, it’s kind of like I forgot that part of it when I got them out, I just started playing and the ideas kept coming (but not for the layered one at the tijme lol). Oh Therese, the colours you used on the first two cards are SO PRETTY! Unfortunately I can’t see the shimmer ink splatters but it is gorgeous as it is. The Iridescent splatters must look amazing IRL though. The video was great and these snowflakes are so detailed they are calling my name. Beautifully done on all counts! ooh yes, they called my name too lol. I know you will love them as much as I do. Therese your first two cards are SO PRETTY! Your colour choice is perfect with these delicate snowflakes. Unfortunately I can’t see the shimmer splatters but I am sure that it looks amazing IRL. Again, the video was great and the wood paper looks so nice with the snowflakes, I don’t think I would have thought to do that but I love it! TFS! I love the colours you used on your first 2 cards and they really show off the beautiful snowflakes. I can’t see the shimmer splatters but I am sure they look amazing IRL. The video is great and I love the wood paper. All your cards are beautiful. You always have make everything look so easy to replicate. Hi Therese. I just commented on Youtube. Those first two cards are to die for (no pun intended) but you used my favourite colours, so I need to go back up and read which ones you used and write it down for when I get some money. Love the wooden ones too, and I think the whole card is funky, not just the big snowflake. I thanked you for your advice on the Youtube comment, but don’t want to do it again here. You always make me chuckle, and I’m always in awe of your “designer brain”. I wish you’d made a video of the first two cards as well – they are gorgeous, and I just love to hear your Aussie accent. Bev from Sydney. Don’t know how it happened, but I’ve got a URL on your page, but it just changed from aqua to pink! Crazy! Don’t know how I got one, but it doesn’t matter, does it? LOL.